Exploring good design for public spaces. Welcome to Ritter Park, Huntington, West Virginia. Another day, another really nice park. This time, it’s Ritter Park in Huntington, West Virginia. It’s just so nice. I could leave it at that and show you the pretty pictures and you would agree. I’ll show the pictures but let’s try to get a little deeper. First, let’s talk about socio-economic context. Ritter Park is located in a rather tony residential neighborhood. Old-school mansions line the street directly across from the park, and in the nearby hills are more up-scale neighborhoods. At first glance, one might conclude that Ritter Park owes much of its popularity to its affluent setting. But the downtown area and other less prosperous neighborhoods are also close by and it wouldn’t be surprising if Ritter Park had its share of trouble. I’ve been discussing safety in public spaces in one of my LinkedIn discussion groups and one associate pointed out that feeling safe is more about perception than reality. Some spaces that seem scary may actually be no more dangerous than Main Street at noon. But perception almost always trumps reality and if a space seems dangerous, people will stay away. Ritter Park feels safe. Why? Malcolm Gladwell argued in his bestselling book, Blink, that our “gut feelings” are actually subconscious decisions that we make as we quickly process information. When we visit a public space, we will consider many things from a safe vantage point. First, we’ll look for a reason to enter the space. What is the attraction? If we enter, will we still be in the view of other people? If we enter, will we be forced to interact with people with whom we may not want to interact? Can we steer clear of scary people? If we enter, are there adequate escape routes? We won’t necessarily consider these things on a conscious level but in a matter of seconds, we will have a “blink” moment and decide whether to engage in the space or leave. At Ritter Park, there are attractions. The extra-wide perimeter walkway is perfect for walking (with or without dogs), running, or sitting on a bench watching everyone else. Huge lawns invite informal ball games or casual strolls to enjoy the occasional works of art. The children’s playgrounds are challenging adventure lands. As for the safety considerations, park administrators have been able to avoid the temptation of trying to cram too many good ideas into the park. As a result, open space is preserved, the user has many choices of where to go, and escape routes are everywhere. Ritter Park is largely an inclusive space, meaning that very little is done to exclude perceived trouble makers. Everyone, it would seem, is welcome. Well, maybe not skateboarders. Anti-grinding angles are anchored to the edges of low walls and a lot of the walkways are not suitable for skateboards. But on any given Saturday you’ll find a broad cross-section of people, ranging from the youth of the counter culture to middle-aged dog walkers who seem to fit right in with the swanky neighborhood. Lessons learned at Ritter Park can be applied to other public spaces, both large and small, but you have to look beyond the pretty pictures. You have to understand the behavior of people. You have to understand their needs (security) and their desires (attractions). Enjoy the pics. Crushed-aggregate walkways are great for pedestrians and are wide enough to allow people to avoid unwanted interactions. Huge expanses of lawn invite active or passive recreation in a non-threatening setting. 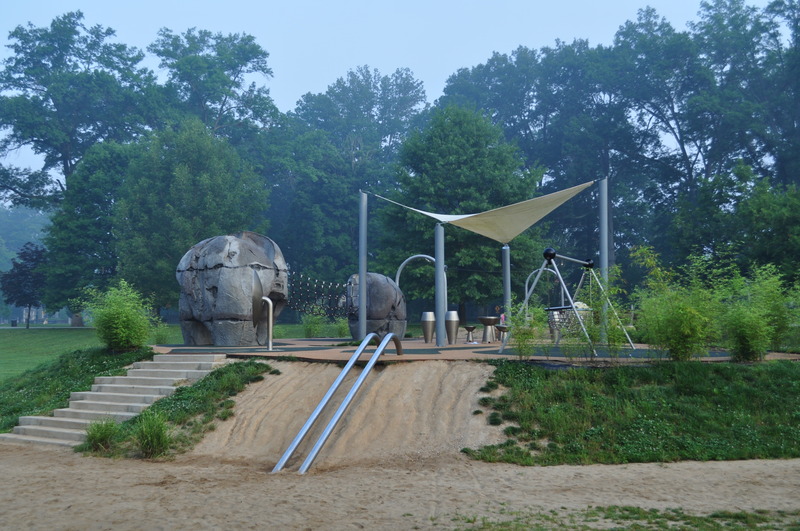 Ritter Park is famous for its adventure-style playgrounds. This recent addition offers rock climbing and zip lining. Because Ritter Park is so interactive, even the more secluded trail across the creek feels safe. R.P. has had problems, but for the most part it’s been isolated, usually resulting in a bad judgement for the individual to be there at that time alone. i think these problem have also resulted because the upper part around the amphitheater and the “knob” are closed to public vehicles…areas only occasioned by a drifting jogger or explorer in the late evening. The police have in the past had horse patrol and still have bicycle patrols on occasions as well. One of the most things i notice about the “feels safe” on the most part of the park, is that it is used by so many people for so many different things and yet it still feels roomy due to the large open area. Ritter Park is one of those amazing spaces that people love and actually use. Charlestonians often lament the lack of such a place in Charleston. How could Charleston’s riverfront area along with Magic Island be improved to make it more like Ritter Park? Is Kanawha Blvd just too much of a barrier to make that feasible? In 2006, the City of Charleston engaged the nationally-known firm of Sasaki Associates to develop a riverfront master plan, which includes Magic Island. Among other issues cited in their report, is the difficulty in accessing the riverfront. Parking is scarce and pedestrians are challenged to cross four lanes of traffic. There are also perceived security issues. The Sasaki plan addresses many of these and hopefully over time, the City will continue to implement elements of the plan. Ritter Park is a true gem, one of the things I really miss about Huntington. Thanks for the post! The heart of McDowell County.